NSF certified for dry storage in a wide variety of environments like restaurants, schools, and cafeterias. Steel shelving provides plenty of strength for holding heavy office supplies like toner, file boxes, and more. Easy-to-clean makes the system resistant to corrosion and ideal for hotels, hospitals, and other businesses. Assembly instructions included, no tools required. Certified by the NSF, Rest easy knowing these shelves meet sanitation requirements for use in restaurants and commercial environments. Height adjustable non-rolling/stationary. Levelers and 4" commercial casters include. Maximum Weight Capacity for entire Unit: 3600 lbs. 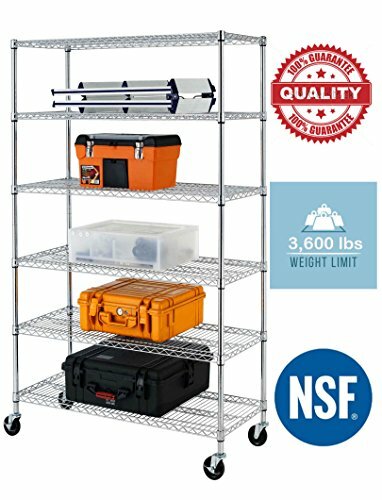 Maximum Weight Capacity per shelf: 600 lbs. Equally distributedMaximum Weight Capacity for entire Unit when using the casters (wheels) instead of leveling feet is 500 lbs. Shelves adjust at 1" increments ;Dimensions: 76 in high X 48 in wide X 18 in deep with casters. Shelves adjust at 1" increments ;Dimensions: 76 in high X 48 in wide X 18 in deep with casters, 72 in high X 48 in wide X 18 in deep with feet levelers. Weight Capacity, 600 lbs per shelf evenly distributed. With feet levelers: 3600 lbs total. With casters: 600 lbs total. Height adjustable non-rolling/stationary. Levelers and 4" commercial casters included. If you have any questions about this product by BestOffice, contact us by completing and submitting the form below. If you are looking for a specif part number, please include it with your message.